DEDICATED to all who are suing pro-se self file ACS,NYS,DSS. Fill out HELP-PAGE found on this page for New York Residents who are being violated by ACS,DSS. (be clear)and ready to fax over same-day,all documentation to begin on your lawsuit for money damages known as PRO-SE.Call if your not receiving a call in 1 hour from time your Email request for same-day consult has been issued. Thank you. 1-855-602-5557 ext. 102 heather-marie rothstein. Case-By-Case Pro-se Student of law ; analysis,without delay.Such lawsuit your looking to file TIMELY,by deadline against caseworker in NEW YORK CITY, NYS ACS,the administration of child protection services,for a violation pursuant to such Gov;Code;statutory;and Federal violation;etc. 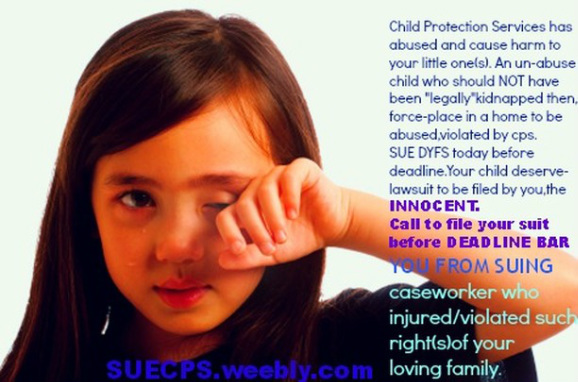 all have to be filed in proper format;and timely so your suit can,and SHALL be sued by a Federal U.S.District Ct.Magistrate for such fair consideration for money damage(s)for all the pain, agony,and suffering your child and yourself,have gone through while child was remove,and or the cont'd harrassment,inequities,cause by child protection services in new york, Hence fill out contact page,today. NO FREE VIDEO OR PHONE CONSULT without filling out contact-help page,then call and ask for owner Bella,ext.260 if not available? her assistant heather-marie rothstein ext. 102.